Here is a different read of recent events. Former United States Attorney for the District of Columbia Joe diGenova suggested Friday James Comey's reopening of the investigation into Hillary Clinton's emails was the product of a "revolt" inside the FBI. "He sent those letters today because he is in deep trouble inside the bureau," he said. "Comey sent this letter today because he had to. He has no moral authority inside the agency right now, he's a joke, he's a laughingstock of the agency, and among former FBI agents, he has become an anathema." "These were found on the phone that was used by Anthony Weiner and Huma Abedin," he said. "Why was that phone not looked at originally?" "And why this letter was sent today was very simple: the agents came to Comey yesterday, they told him about the evidence, and he said oh 'S', and realized that his goose was cooked, that this would prove conclusively that his original investigation was incompetent, and he knew that the agents running the Weiner case would leak it if he did not send this letter to congress." "And I've also been told something very significant, it's been reported that those laptops [belonging to Clinton aides Cheryl Mills and Heather Samuelson] were destroyed, they were not, and the reason is the FBI agents refused to do it." Looks like president Obama just canceled 4 out of 4 planned speeches for Hillary Clinton. He did add one in Orlando. Word is that the Justice Dept. and White House were blind-sided by the FBI announcement. (Comey might have been in a situation beyond his control.) I guess it is clear by now. Attorney General Loretta Lynch advised Comey against sending a letter to Congress about the FBI's reopened investigation into Clinton's emails. Comey broke away and sent a memo to bureau staffers explaining his decision to notify Congress. He wrote that the FBI would not 'ordinarily' inform Congress about its ongoing investigations. But said he noted he felt an 'obligation to' given that he testified repeatedly in recent months that bureau's investigation was completed. "Justice" Department tries to put defensive line up for hobbled quarterback Clinton, in her own end zone, for one more play. 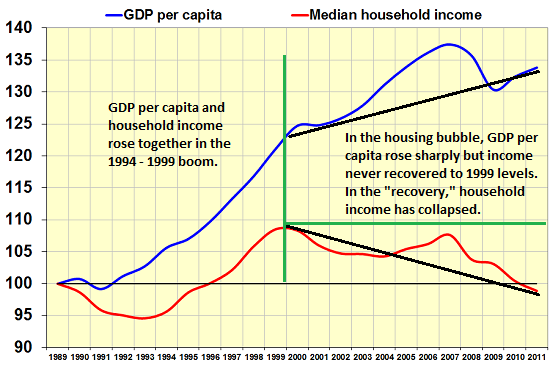 The Disaster of Inflation (for the bottom 95%) Charles Hugh Smith It's getting worse and worse for most people, and has for a long time. Wanna become collateral-damage in WW-3? Me neither. Why are we all still standing in this line? Really? Is there another line? Chris Martenson: "My growing concern here is that the juggernaut that leads to war has already been untethered and is building up steam. I see it in the propaganda pieces against Russia on an almost daily basis. And I see Russia doing everything it can to both try and get the West to calm down and be reasonable, while getting its own citizens ready in case those efforts fail. Recently, for the very first time in my entire life, I have begun undertaking actual personal preparations for nuclear war." Mass Consumption is Causing Mass Extinction. Can We Stop (voluntarily)?